Loot dungeons by night, sell the spoils by day! 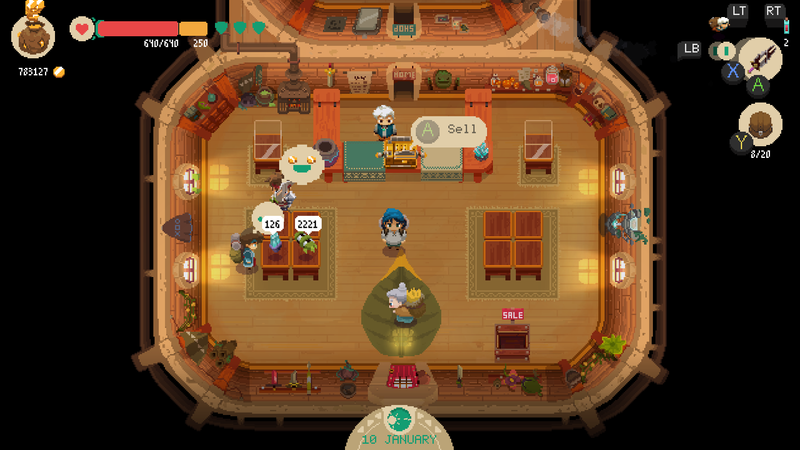 Moonlighter is the Zelda Shopkeeper we all need. If you’re curious about a Zelda-like action game with multiple weapon styles, upgrade paths and playing the shopkeeper as well as the hero. Well, this Moonlighter review might just be up your alley! Developers Digital Sun have crafted a beautiful, modern game with retro inspirations that fall just shy of achieving greatness. There’s much to love in the different weapon styles and the ability to upgrade your shop and town. All from the money earned by selling what you find in one of the five dungeons. 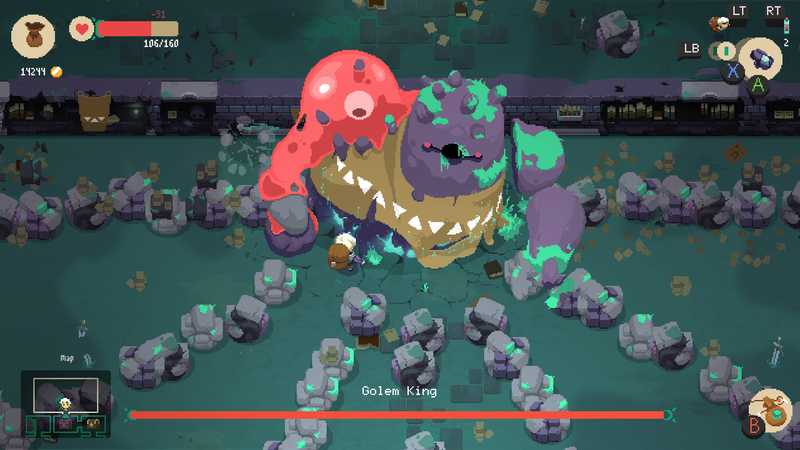 The act of combat is simple yet enjoyable, especially in Moonlighter’s boss fights at the end of each dungeon. Selling goods is fairly easy to navigate and the customer response to the pricing of your goods is communicated clearly, as well as being simple to adjust. Moonlighter is available on PlayStation 4, Xbox One, PC and comes to Nintendo Switch in November. Is it worth you picking it up? Find out more in my detailed review below. Moonlighter is an action game with light RPG elements from a top-down perspective. In many ways, it’s inspired by classic Zelda games like A Link to the Past. Players take control of Will; the inheritor of the store “Moonlighter” at the behest of his family. Will, however, has always had the urge to dungeon crawl like a real adventurer. Thus, he moonlights (see!? IT’S IN THE NAME!) as an adventurer at night. By delving into dungeons, players can gather up to 20 item types (stackable, depending on their curse – we’ll get to that), return to the store and set a price to sell them for. These items drop from defeated enemies and appear inside of chests within the dungeons. Each dungeon has three levels and a boss level, with the higher-value loot hiding in the deepest reaches. But dying means being rejected from the dungeon and losing all of your loot. Each dungeon run has the player making that judgement call: can I really defeat the boss with my current weapons and/or armour? Have I got enough health or potions left to take on another room filled with enemies? Or should I use my trusty pendant to escape now with the loot on hand, upgrade my town and/or gear and do a better job next time? The answer is often the latter in the early game! The enemy types are varied enough to keep you on your toes in battle. Some shoot streams of seemingly lethal water across the screen. Others might float over the rocks that’d block your path to dive-bomb the player. Luckily, there’s a dodge-roll to help evade the worst of it all. The best bit about the dungeons are the bosses. Those fights really make the player consider their weapon type. Some bosses are easier to deal with using the bow, others with the Greatsword or fist weapons. 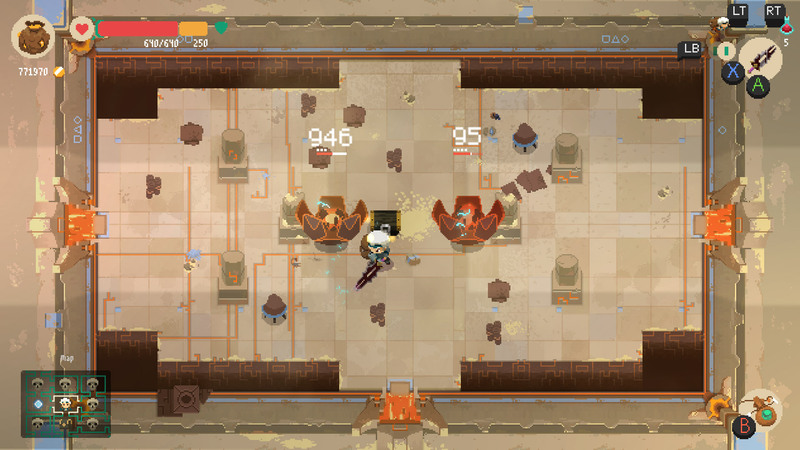 My main criticism of Moonlighter is it doesn’t quite lean into the Zelda-like aspect of it enough, which leaves every dungeon feeling rather samey outside of their setting. The enemies may get a bit harder, but there are no special items or keys to retrieve in order to reach the boss. I think it would have added some variety to the dungeons if Digital Sun had added some puzzle elements to Moonlighter. But it’s apparent that wasn’t their intention. The Moonlighter shop is located in the small village of Rynoka, where the five mysterious dungeons lay waiting to be plundered. When said plundering is done, players return to the shop and do their day job: selling goods. The goods you gather from dungeons can be sold or used as upgrade materials, so it’s best to check that out before selling a nice stack of magic wood. Moonlighter begins with just four slots for selling items. Once an item is sold, a new item can be placed on the pedestal. When placing items, the game asks what you want to charge for the item (per item, even if you place a stack on one pedestal). When you open the store and customers start pouring in, they’ll approach your goods and react one of four ways, represented by their own simple-yet-effective emojis above their heads. If it’s a negative reaction, there’s no repercussion – just adjust the price down and try again. If they react too positively, you know you’ve charged too little and you need to up the cost of that item! With the gold earned from a hard day’s work in the shop, players can bring in new specialists via the town notice board. 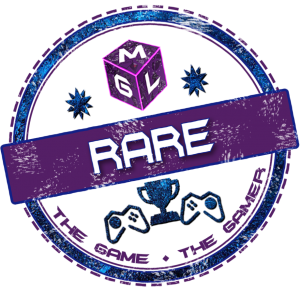 Said specialists will offer potions, weapon sales and upgrades, decorations for your store or rare goods you’re having difficulty finding (for a steep price!). Not only that, but the money can be used to upgrade Moonlighter itself. Upgrade the store for more space to sell things, or upgrade the bed for bonus health when you wake up. If you purchase a better cash register, customers will give much bigger tips on items purchased. The gameplay loop is pretty addictive and feeds itself very well. Moonlighter is a gorgeous game. I really appreciate the art style, which is reminiscent of a highly polished Super Nintendo game. Imagine if gaming never went 3D and instead evolved from a 2D, top-down perspective. That’s Moonlighter in nut-shell. On top of the basic description, the game pops with colour without being abrasive. 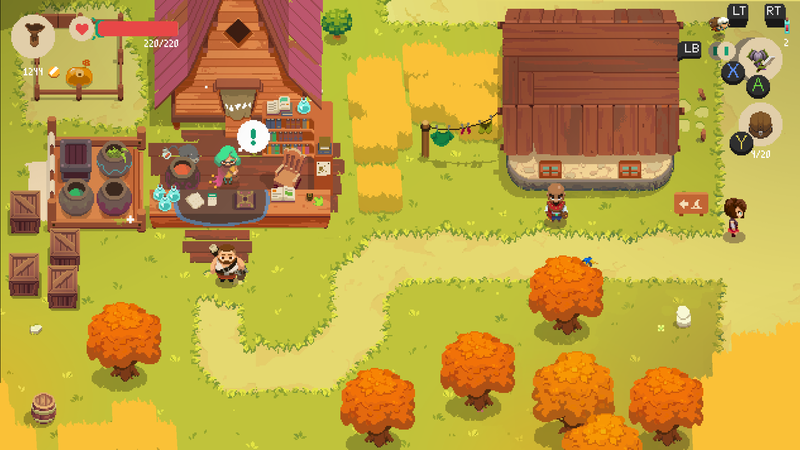 There’s something soothing about looking at Moonlighter, especially in the town itself. Moonlighter – outside of a few crashes pre-release – has performed well technically. I rarely have issues with its performance, if at all. And the music is as memorable as anything I’ve ever heard, even more calming than the visuals. If I were to pick out a negative, it’d be the inventory management. Managing the inventory is a huge part of this game but the stack numbers feel a bit arbitrary at times and it can be frustrating being in and out of the bag so often. That said, there are bulk movement options available between chest storage and the bag, but it can still feel a bit muddled. In Moonlighter, players take control of Will on a looting, action-adventure featuring five main dungeons. Each dungeon has a boss after three floors that’ll unlock the passage to the next dungeon in line. The dungeon diving is done is service of reviving the Moonlighter store, upgrading the town and discovering the secret behind the green-goo found in said dungeons. That’s about it, to be honest! One mode, but it’s a meaty one and well worth your time. Moonlighter is a brilliant game. The loop of action and shop-keeping means that every drop from an enemy feels meaningful and it always feels satisfying. I only feel it doesn’t go quite far enough into its Zelda-like features, with the dungeons being a little too easy ultimately. A few puzzles here and there would have been welcome, but that’s not a major issue compared to everything Moonlighter does incredibly well. Admittedly I was disappointed by the story’s ending, the pay-off at the end was underwhelming but the journey there was fantastic. I highly recommend this game for its style, music and well-paced upgrade paths as well as enjoyable boss fights. Given it’s coming to Nintendo Switch soon, I really can see Moonlighter being a great title to take with you on the move. Classic, 2D Zelda fans that want something a little more easy going will find much to appreciate about Moonlighter. For those seeking a fairly peaceful, laid-back experience, Moonlighter offers that in spades. You've read our review, and maybe a few others on this title. Are you interested in getting Moonlighter? Have you already played it? Game Reviewed: Moonlighter digital edition, provided by the publisher.